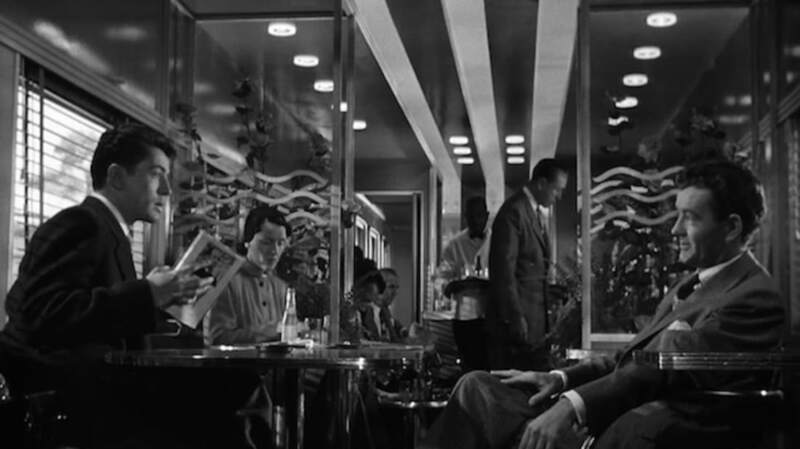 After a brief slump in the late 1940s, Alfred Hitchcock re-earned his standing among critics and audiences with Strangers on a Train, a perversely amusing 1951 thriller in which a psychopath tries to get a famous tennis player to commit a murder for him. Like most films from the Master of Suspense, Strangers on a Train is loaded with indelible images (the speeding carousel!) and darkly humorous dialogue, all designed to delight, entertain, and shock moviegoers. Since it's still doing all three of those things 65 years later, here's a batch of behind-the-scenes info to help you appreciate it even more. 1. IT CAME FROM THE WOMAN WHO ALSO INVENTED THE TALENTED MR. RIPLEY (AND CAROL). Published in 1950, Strangers on a Train was the first of 22 novels to be written by Patricia Highsmith, whose subsequent work included five books about a talented sociopath named Tom Ripley and one, The Price of Salt, that was adapted into recent Oscar nominee Carol. 2. HITCHCOCK BOUGHT THE MOVIE RIGHTS FOR NEXT TO NOTHING. 3. SEVERAL TOP WRITERS TURNED DOWN THE CHANCE TO WRITE THE SCREENPLAY. 4. RAYMOND CHANDLER'S NAME IS ON THE FILM, BUT HE DIDN'T WRITE ANY OF IT. Hitchcock got the mystery novelist to write a draft of the screenplay, and then a second draft, but the two men disagreed on almost everything and had wildly different working styles. They parted ways acrimoniously. Their one area of agreement was that the finished movie used virtually nothing from Chandler's drafts, and that he shouldn't get screenplay credit. But Warner Bros. wanted Chandler's name as a selling point, so the credit remained. The bulk of the screenplay was actually written by three women: Czenzi Ormonde (who's co-credited), production associate Barbara Keon, and Hitchcock's wife, Alma Reville. 5. SOME OF ITS MOST FAMOUS ELEMENTS WEREN'T IN THE BOOK. 6. THE CIGARETTE LIGHTER WAS PRODUCT PLACEMENT. Guy's monogrammed lighter is a crucial part of the film's story, but in the novel, it's a book that Guy leaves in Bruno's compartment. Why the switch? Money and favors, of course. Game show producer Gary Stevens was approached by one of the show's sponsors, Ronson Lighters, and asked if he could use his personal connections to get a Ronson into a Hitchcock film. Stevens mentioned it to Hitch, who said he'd "work out something"; Stevens was astonished when the lighter turned out to be the center of attention. He recalled, "We had dinner one night, and [Hitchcock] said, 'Gary, you better do a good job on this one, because I put your damn lighter in there.'" 7. HITCHCOCK WANTED GRACE KELLY BUT GOT RUTH ROMAN. Grace Kelly, who was not yet well known, would later star in three Hitchcock films (Dial M for Murder, Rear Window, and To Catch a Thief), but the director was unable to hire her to play Guy's girlfriend, Anne, in this one. That's because he'd already hired Robert Walker and Farley Granger, who cost extra because they were under contract at other studios, causing Warner Bros. to insist that Anne be played by someone already on their own roster. Hitchcock never treated Ruth Roman very well, partly because he felt she was wrong for the role and partly because he didn't like not getting his way. 8. ONE OF THE ACTRESSES WAS BASICALLY BLIND. Hitchcock wanted Guy's trampy wife, Miriam, to wear thick eyeglasses. This posed a problem for the actress, Laura Elliott, who had 20/20 vision and was rendered essentially blind by the lenses. She had to be led around by the other actors or drag her hand across tables and walls to feel where she was going. 9. THE CAROUSEL SCENE WAS GENUINELY DANGEROUS. Hitchcock sped up the film to make it look like the merry-go-round was merry-go-rounding faster than it actually was, but it was a perilous stunt even at the slower speed. The carousel operator—not a professional stuntman—volunteered to be the one to crawl under it, and he really did have to crawl with a whirling carousel just inches from his head. "If the man had raised his head even slightly," said Hitchcock, "it would have gone from being a suspense film into a horror film." 10. HITCHCOCK DIDN'T LIKE THE ENDING—EITHER OF THEM. As shown in theaters, the film ends with Guy and Anne on a train, where Guy is recognized by a fellow passenger but leaves before he can get into any further trouble. The version that Hitch showed to preview audiences ended with the brief scene before that, where Anne gets a phone call from Guy letting her know he's OK. But Hitch would have preferred to end the film even earlier than that: at the carnival, just after Guy is cleared of killing his wife, when he describes Bruno as "a very clever fellow." Warner Bros. insisted that ending was too abrupt and wanted things resolved a little more thoroughly. 11. HITCHCOCK DID A LOT OF MICRO-MANAGING. Hitch was always a hands-on director with a perfectionist streak, but he was unusually involved in the details of Strangers on a Train. He designed the lobster necktie that Bruno wears, personally chose the garbage (gum wrapper, orange peel, etc.) for the sewer grate that Guy's cigarette lighter falls into, and considered Bruno and Guy's choice of meals on the train to be significant insights into their characters. 12. THE DIRECTOR'S DAUGHTER GOT NO SPECIAL TREATMENT. 13. IT INSPIRED THE PLACEMENT OF CAROL BURNETT'S STAR ON THE HOLLYWOOD WALK OF FAME. When the comedy legend received this honor in the 1970s, she asked for the star to be placed at 6439 Hollywood Boulevard, in front of the Hollywood Pacific Theatre. Burnett had been an usher at that theater as a college freshman, when Strangers on a Train was playing, and was fired for advising patrons to wait for the next showing rather than enter the theater late and have the ending spoiled.